1. Be Adaptable to Weather Changes The first thing most people think about when they think of the desert is….. HEAT! But don’t be surprised if you find yourself running in the wind and rain. My first adventure in the Sahara desert was accompanied by rain and hail during the last stage of the four day race. Honestly, I WELCOMED the rain as it made it easier to negotiate running in the sand. And the hail,…well, it kept me alert and on my toes, which helped lighten my steps. Being adaptable will serve you well! 2. Get Savvy with Gear Temperatures in the desert can be extreme and can range from 37 to 0 degrees Celsius (100 to 31F). Come prepared with the right gear to dress for success. This includes: light, breathable material that moves away water for running in the heat and polypropylene layers, fleece and hat for cold nights. Packing a windbreaker for windy moments on or off the run is also a desert savvy thing to do. 3. 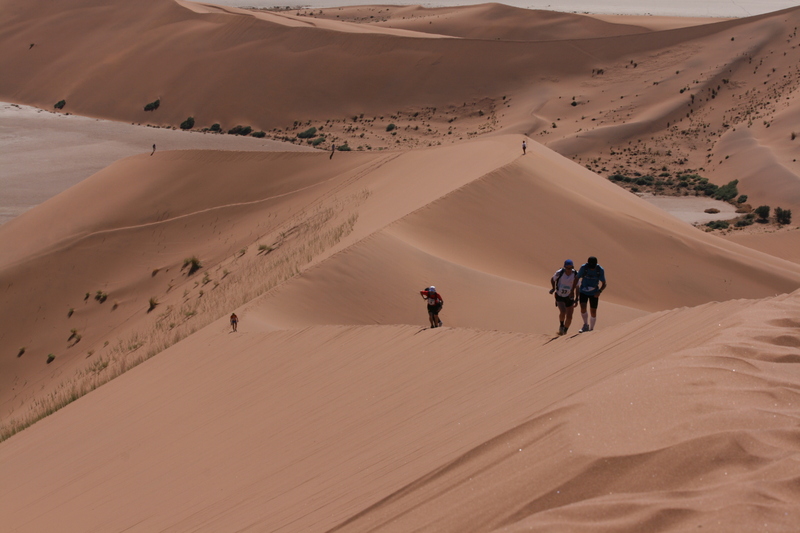 Know Your Salt Type With the combination of heavy exercise and heat, salt supplementation is crucial for running in the desert. Some people use simple table salts while others prefer supplementations with a combination of electrolytes (with Mg included). We all have different sweat rates and stomachs, so experiment with different products to see what works best for you…. before you get to the race. 5. Baby Your Feet Beyond shoe wear, taking additional care of your feet can make or break your long training or endurance race. Blisters gone bad can have you limping and missing out on crucial mileage and/or fun with your friends. Try vaseline or some other lube and lather up your feet before a long run or race. 6. Take Care of Your Soft Tissue Running is physically demanding…and preparing for an endurance run in the sand even more so. Taking care of tired, inflamed muscles is just as important as your actual training. In a period of intense training, schedule in regular massage (weekly if possible!) and place emphasis on consistent stretching, foam roller exercises and yoga… and sleep! help avoid overtraining and make you less prone to injury. 8. Get Your Training Customized We are all different and have different needs and focuses when it comes to training for big events. A customized, targeted program that takes your specific lifestyle, personal needs, fitness level and goals into account will be your KEY to SUCCESS!